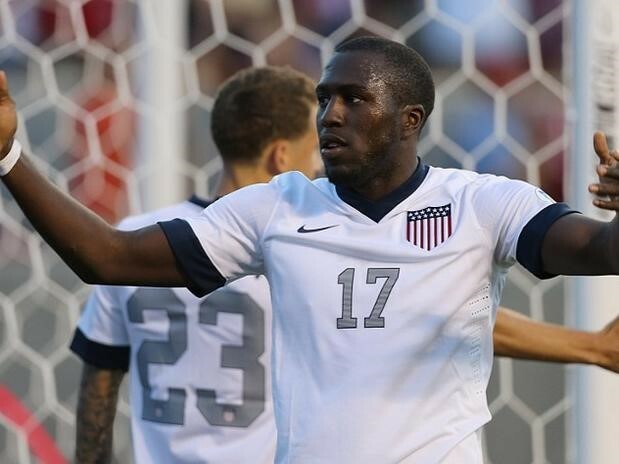 Home » Goalkeeper » Altidore comes up big for the U.S.A.
Altidore comes up big for the U.S.A. It was a 73rd minute goal from the inform Jozy Altidore that provided the United States with a 1-0 victory over Honduras last Tuesday evening in Sandy, Utah, that will almost certainly mean that the Star and Stripes will be heading to Brazil next summer for the 2014 World Cup finals. The win gives Jurgen Klinsmann’s men 13 points and top place in their qualifying group ahead of Mexico and Costa Rica. The Americans play again, away to Costa Rica September 6th before finishing out the qualifiers by playing Mexico, Jamaica and Panama at home. The top three teams qualify for Brazil with the fourth placed finisher playing Oceana’s New Zealand for a place in the finals. The Match played before a full-house in Salt Lakes Rio Tinto stadium got off to a slow start as the two teams were weighing each other up. In their last meeting back in February played in the scorching heat of San Pedro the Yanks came up short losing 2-1 and were now hoping to make up for that loss by beating the Hondurans on home turf. The Americans dominated the first half but could not find a way through the Honduran defense with both teams trying to cope with the thin Rocky Mountain air. Following the break the Americans thought they had made a break through when in the 59th minute Jozy Altidore put the ball past Honduran keeper Noel Valladares only to see the flag go up for offside. From that point on the U.S. upped the pace knowing that it was only a matter of time before they would score with the long awaited goal arriving in the 72nd minute when Fabian Johnson delivered a pass to the unmarked Altidore allowing the young striker to put away an easy goal. It is Livingston NJ native Jozy Altidore that people will be keeping their eyes on with reports out of Sunderland, England saying that their Premiership team owned by Ellis Short, a Missouri-born and Dallas-based businessman are interested in signing the 23-year-old American striker. Altidore currently plays in the Dutch Eredivisie for AZ Alkmaar, scoring 31 goals in 41 matches that has got the interest of the Black Cats, and according to AZ sporting director Earnie Stewart himself a former American International Sunderland are not the only club that have sent scout to watch him. His current run of form can only help his prospects of joining a bigger club either in Holland or elsewhere in Europe, and we will be sure to keep you informed of all summer transfers that are made by any of our national team members.